Toshiba Materials manufacture Samarium-Cobalt magnet as rare earth sintered magnet that excel in temperature property. Lineup of our Samarium-Cobalt magnet include high flux density type to high coercively type depending on customer applications. 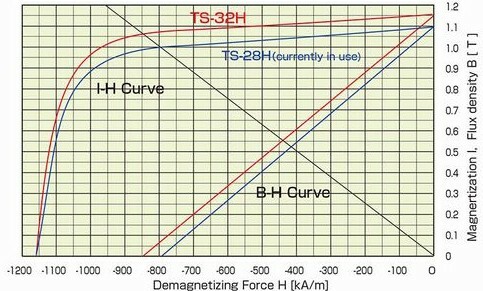 Currently, we are advancing with development of high energy product type new material TS-32H(Perpendicular magnetic field press type) and TS-30H(Parallel magnetic field press type). 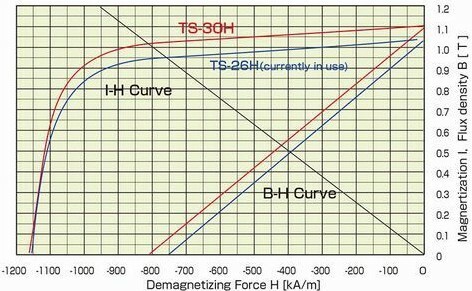 Intrinsic coercive force iHc to be set around 1,200kA/m where magnetization is relatively easy after assembly to rotors etc. Price of Neodymium magnet, which is currently main material for rare earth magnet is significantly increasing due to recent price increase of rare earth raw material, especially Dy (dysprosium) that is added to improve thermal resistance. Because Samarium-Cobalt magnet does not include Dy, price is relatively stable and increased number of customers are reconsidering use of this material.